In the second part of this interview, Richard Linklater evokes the issues he had to face when distributing his films in France and in the US, his partnership with actors Julie Delpy and Ethan Hawke and sports. Emmanuel Burdeau: Some of your films have never been distributed in France. What happened to Me and Orson Welles for instance? 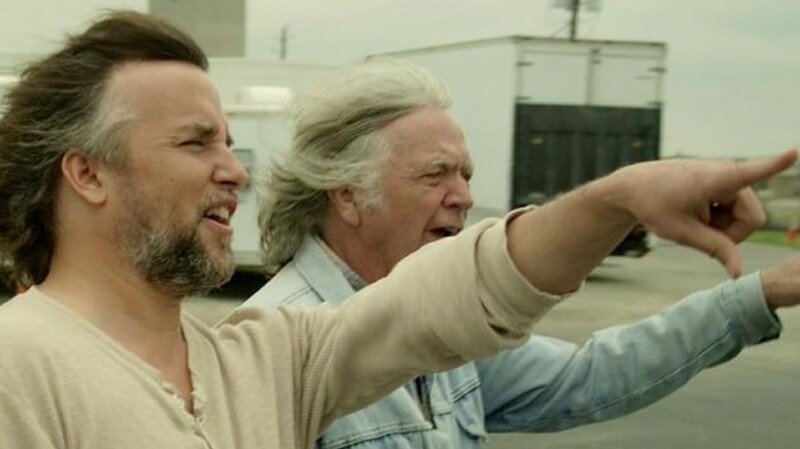 Richard Linklater : By the time when the release was scheduled, we were in the middle of this big financial crisis. The film did work on some territories though. It seemed somehow random. Even if you work with a good foreign sales, agent or company – which sometimes happens, sometimes does not – you do not have the assurance for a broad audience. That was too bad. I think it actually did well in Australia. We should have put the emphasis on Orson Welles rather than Zac Efron. But the distributors thought kids who saw High School Musical would come to see this. I love the industry for that: everyone is optimistic. For every film you make, there are people out there who can see it. But they are very difficult to reach. Each movie you make is different from the one before. So it may be hard for the audience, or for the press, to put a pin on you. R. L. : Different films would go for different audiences. I don’t have a brand. This is for better and worse. Some directors, Quentin Tarantino for instance, also pick different genres every time but still reach so many spectators. You had two movies in Cannes 2006 : Fast Food Nation and A Scanner Darkly – which really amazed me because they are two very different movies, one being the first computer rotoscoping. R. L. : No, I had made another one before, Waking Life. But it was a more mature version of that – using the same technique, but in a much more refined way. A Scanner Darkly was at Cannes in the Un Certain Regard selection, and Fast Food Nation was on the official competition. But both films are both repudiations of the United States in their own way. I never went to McDonalds again after seeing Fast Food Nation. R. L. : Good ! You should never go again ! I can’t believe I got access to all that. That movie was tough. It’s very dramatic. I almost though that was like my Ken Loach film, that kind of more social and political topic. It was fun to try to make a film about my political views even if it’s probably not what I meant to do completely in the first place. Fast Food Nation was almost my Ken Loach film. What kind of response did it get? R. L. : I think it got good reviews, actually. It’s just that people don’t want to see it. People don’t want to see a film that ends up in an abattoir. But there is a great tradition of movies about abattoirs. Rainer Werner Fassbinder’s In a Year with 13 Moons for instance. R. L. : I mentioned this film so many times. I did an introduction to it in the bonus of an American edition of the DVD, on the label Fantoma. They asked me since I always list it in my fav’ films list. I was just getting introduced to cinema when he died. I had just seen Lili Marleen at the theater and The Angst of Veronica Voss – I had seen those two when he was still alive. I saw François Truffaut’s and Andreï Tarkovski’s films when they were still alive. Truffaut was 52 when he died – my age right now. I realized just the other day that it was way too young. I was like 24 when he died and at the time I thought: « Well, 52 is pretty old. » But he had so many more films to make. It’s such a tragedy. He was the youngest of the French New Wave and the first to die. Godard was born in 1930, and Truffaut in 1932. Chabrol, 1930 too. Rohmer, 1925. And Rivette, 1926 or 1928. R. L. : A lot of filmmakers were born in the 1930s. Like Kubrick, in 1928. And Jean Eustache or Alain Resnais. There was a concentration. I think Polanski is somewhere in there too. Is there a cluster around 1950 ? I don’t know. Yes, Jim Jarmush. Olivier Assayas maybe – yes, 1955. I haven’t seen his new film. But I liked Carlos. Olivier Assayas is among the rare French directors who has a consistent international reputation now and I’m not sure he deserves it. R. L. : Success is weird especially if you really know the national production of a country. If you go to Sweden and mention Ingmar Bergman people will just go : « Pffff. » I was friends with Lindsey Anderson. If you mentionned David Lean to him, he would go : « What is this David Lean’s obsession ? You guys are obsessed with a unique British filmmaker and this is David Lean… » It is the one that gets exported as the spokesman of your country. But one always thinks : there is so much more. What about this filmmaker or that filmmaker? Do you have the same feeling with how people look at the American cinema right now? That we might have the wrong obsession so to speak? R. L. : Probably. People only know genre films, like Quentin Tarantino’s. I don’t begrudge Quentin, I like his films a lot and he is a friend. But his films are not about American culture. They are about Quentin’s cinematic imagination. In Germany, at a time, it was all for Werner Herzog, Fassbinder and Wim Wenders. There is actually a lot of other filmmakers. Why those three ? They are great, but there is probably five or six more. Do you like Werner Herzog? R. L. : Yes. You kind of have to ! There is so much there. I don’t know him personally. He seems to be such an odd guy. I don’t think there’s any filmmaker who’s been equally great in documentary and narrative. Most people cannot do both to that level. I met him once in Munich in 2007, they were doing a retrospective. I had just arrived in Munich. I got off the plane, I was standing outside the theater, and I look up and there is this guy walking towards me with this big smile and it happens to be Werner Herzog. « I saw many films of yours », he said. He was with his son who was dragging him to see one of my movies. He was a fan. Werner Herzog was just back from the Arctic where he was shooting Encounters at the end of the world. He was back from an heroic adventure so to say. There is really no one like him. So I love him. He is crazy – I like that. You haven’t made any real documentaries, have you? R. L. : Not really. I did a documentary – a feature film, 90 minutes or something – in Austin for the ESPN sports channel, about a baseball coach : Portrait of a Coach. He’s a friend of mine. He let me follow him around for a season. I had a camera on him while he talked to the players. So it’s a very inside look. It’s really more about his philosophy. I wouldn’t have done it if it would have been about just baseball : I knew that would be boring. I like working with philosophers. He is one, that is how I see it : a working philosophy of life and systems. He’s a coach from college. College baseball isn’t that popular really. It’s mostly professional baseball. In the US, it’s all about the college teams : football, basketball, baseball. College matches are broadcast on TV. The professional teams are only in the biggest cities. And it’s such a big country ! Many states do not have their own pro team. 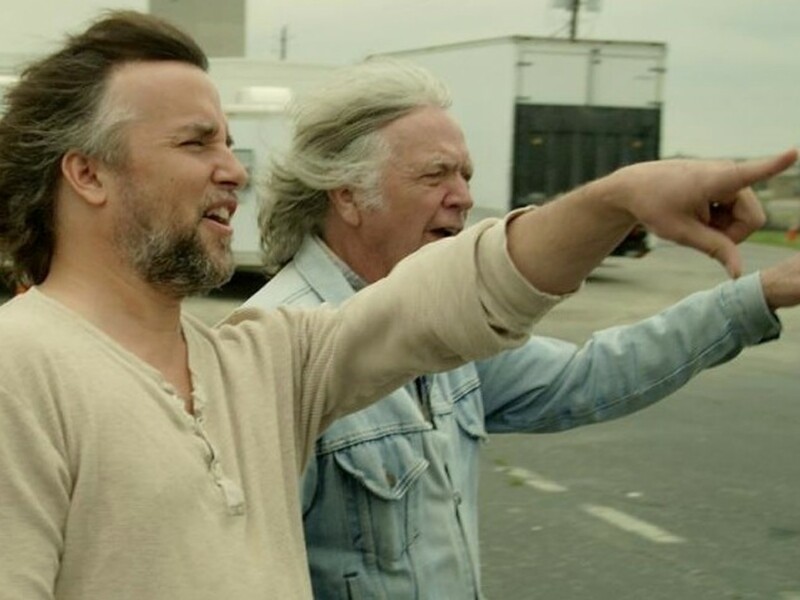 Double Play: Richard Linklater & James Benning (Gabe Klinger, 2013). What is your relationship with James Benning? R. L. : He was the first visiting filmmaker for the Film Society in 1988. I invited him to present a few films. We have been friends ever since. The Film Society has shown a lot of his movies. In the United States most people don’t know his work. How did you discover his films? R. L. : Good question. I had seen one or two films in a museum and liked them. I was just starting to make films myself and I thought those were interesting, very precise. He’s a really serious artist. Do you know him? Not really. I saw his last film in Berlin. R. L. : I don’t think I’ve seen that one. It’s a wonderful film. It has only four shots for two hours, but it’s a great film. R. L. : Americans have no patience for that. But I showed four of his movies in Austin. I invited James to come to Austin and present them and Gabe Klinger got this idea to make a documentary of it. So it’s a documentary about the friendship between the two of you? R. L. : I guess. I don’t know. I was very reluctant to be a subject of someone’s documentary, but Gabe explained he would only be filming for a week-end, introducing James’ films at the Film Society, playing baseball or hanging out, chatting. But he also didn’t say it was going to be on Kickstarter. So when I saw James, he was laughing and said : « Are you as embarrassed as I am ? » And I said : « Yes, Gabe didn’t say I was gonna be begging money from all our friends. » But Gabe is a good guy. I like him. He’s a serious film person. You knew the Peloponnese before making the movie? R. L. : Yeah, I’d been there once. I dated a girl a long time ago who was originally from there but I didn’t film these locations. My producer here was Christos Konstantakopoulos. He had started to work in the film industry quite recently. He showed me some locations like the writer’s house, at the beginning of the movie. He had access to that because his family has a big industry – they are very influential in that region. So we got an access to the airport when most airports don’t let you film inside. That makes a big difference. They were naming the local airport after his father, so it helped that he was his son ! R. L. : Yes, we work really closely now. On our first film, I wrote the script and then I worked with them in rehearsals very tensely for three weeks. But the next two films, it made sense that we all worked on it together. The democratic nature of our collaboration is wonderful. Like Jean-Pierre Léaud was co-writing with Truffaut on the Doinel series. I’m sure he had ideas. R. L. : I have a good distributor : Sony Classics. They are releasing the film in almost 800 theaters. They’re maximizing it. With Bernie, they never went very wide. They could have, because it got a great response. Even people from small towns liked it, everybody did. They didn’t put it in all the theaters. They still kind of played it like it was an independant film, and it could have gone much more mainstream, but they didn’t want to. It’s frustrating as a film director because you don’t have control over that. Film directors are control freaks. But at that stage you don’t have any control, so what can you do? Is Before Midnight an expensive movie? R. L. : No, the three movies cost about the same : around 3 millions, which is not a lot. And how long did it take to shoot it? R. L. : Fifteen days. I had twenty days for the schedule, but I told my Greek producers : « Three days ? We can do that in two days. Two days ? We can do that in one day. » I had an outline. I just knew how well rehearsed we were gonna be and how I was going to shoot it. So you actually rehearse before flying to Greece. R. L. : Not so much. We were still writing. There was a really concentrated ten weeks here last year. We had an outline and we were starting to write. Ethan and I were working on it before Julie joined us. We really finalized the script here. It’s tough to make a film about that age I think – to make this part of life interesting. They are 41. It’s not the blossom of youthful romance. The middle areas are hard to depict in a compelling way. 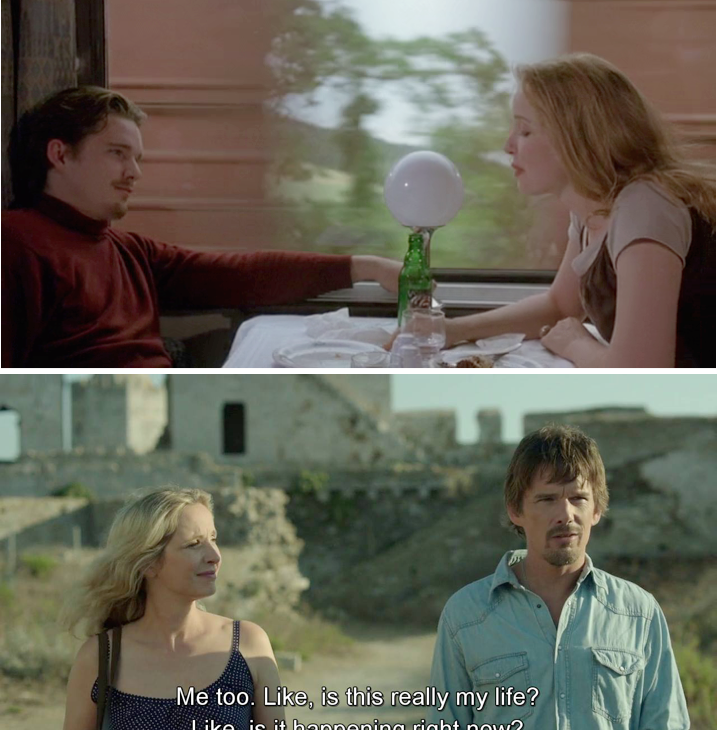 Before sunrise / Before midnight. The actors are actually that age? R. L. : Yes. Ethan is about to turn 43. And Julie is 43. That’s the dynamic. I’m looking back at them. They’re in that age and I’m looking back at that age – that’s how it has always been. They both have kids. We all do. Between us, we have eight children. Nineteen years ago, in Vienna, I had a daughter who was turning one. And now we have eight kids, and my one year old is now 20 years old. She’s a painter, but she’s a student – she goes to an art college. Is Julie easy to work with? She has a strange reputation. R. L. : I’ll answer this carefully. I love her almost like family. But Ethan and I looked at each other and said : you know, if we were working together for the first time, and I didn’t know her so well, I would replace her, I would have to. So that tells you something. Ethan has always been easy to work with. He helps everyone to do their job better. But you take the good with the bad. The good is her in the movie. But we’re like family and I accept her as a crazy little sister. And we do have a lot of fun working together. We laugh a lot. And the character played by Ethan Hawke, is he a lot like you? R. L. : He is probably some combination of me and Ethan. And Julie is a projection of Ethan and my part of Julie that we have channeled and presented, the best part of her, with a little touch of the worst. Does that mean Ethan Hawke and yourself are much more involved in the writing of the movie than she is? R. L. : Julie is very good at writing, like in the first movie. She’s good at talking and coming up with funny things. We pull things out of her. She would tell a funny story and we would be : « Let’s put it in the film. » So we write in a really fun way together. It’s an equal collaboration. Julie is very honest and has a great sense of humour, even about herself. That’s what I love about her. It’s not vanity. She doesn’t mind being laughed at a little. You see it in her own movies. 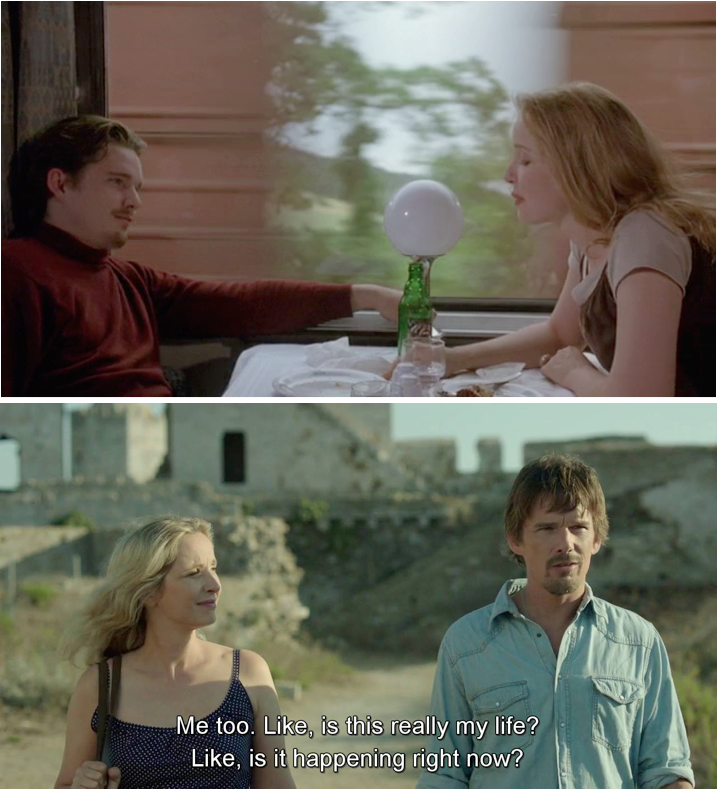 I especially like the end of Before Sunset where Julie Delpy dances in order to make him not go to the airport. R. L. : That’s a good example of how we work. We just sit in a room and talk. We’re sort of working and we’re sort of not. And once, we were talking about Nina Simone. I said : « I like her, but I’ve never seen her on stage » and Julie said she had. She was talking about how she would perform. I was sitting across the room and I told Ethan: « That’s the end of the movie. » Julie said she wrote the end of the movie. She didn’t write anything ! But she inspired it. HOW DO WE WORK? WE JUST SIT IN A ROOM AND TALK. R. L. : At a casting session. I saw Ethan in a play. But initially the idea for Before Sunrise was very personal. I met this girl once. We walked around Philadelphia one night. We were young. We kept in touch a little bit on the phone, but it’s hard when you live apart and it went away. People forget how we used to be lost – you lose the phone number, and they move, etc. It was before Facebook. And it was kind of romantic too, to not know so much. After the first film, which I did years after that night, I thought I would be in Philadelphia or somewhere, and she would show up. I didn’t even remember her last name – it was that kind of night. I don’t remember what we talked about. Like in the movie. Except not in Vienna, but in Philadelphia, which is also an interesting walking city. Where did you shoot the whole hotel scene of Before Midnight? R. L. : At Costa Navarino, a resort that my producer’s brother owns. In fact, their father owned the whole region and had developped it. He was an environmentalist trying to protect that area and develop the economy. When their father passed away, the sons fulfilled his dream of building this hotel. It’s a nice place. There is grass on the roof. There is no lights so the turtles can hatch. It looks like a movie set. I want to go back there and not work fourteen hours a day so I can actually play tennis. R. L. : Yes, that’s my sport nowadays. I play singles. I saw the US Open final. I was in New York once and got invited by a friend. I saw a final of Agassi and Federer – old Agassi VS youngish Federer. It was amazing, how good those guys are, how quick they move, it’s unbelievable. I played it as a kid and then I didn’t play for a long time. But as an adult I have rediscovered it, the last eight years or so, and I’ve been playing a lot. I’m a baseline player. If I would be five years younger, I would have a two-handed backhand. I wish I have developped a two-handed backhand. I never could. I took a lesson once. I was in Hawaï and I hadn’t played for ever and that’s when I rediscovered it, and I said to the teacher: “Teach me a two-handed backhand” and he looked at my backhand, he looked at my two-handed, and said : “You have a one-handed backhand”. Have you ever read David Foster Wallace’s essays on tennis? He was a tennis player himself to a certain level. He wrote very clever things about the game. These essays are very entertaining. David Foster’s books are sometimes kind of dense, but his essays are great. There is a series called A Supposedly Fun Thing I will never Do again, and there’s a couple of essays in there on tennis – one on Tracy Aliston and another one on Federer. He talked about Connors and about his ugly, flat game. He wasn’t graceful like Federer. He played it rough. But as a kid, I loved him. I think Connors get credit for taking the game out of the country club. He sort of set the stage for McEnroe and those guys. We are in a new area and there is so many good players. I think many guys playing now are the best ever – Nadal, Federer, Djokovic. There is not one American man in the top ten. Rodik retired. It’s unthinkable – when I was a kid : Smith, Connors, Agassi, McEnroe, Roddick… But they went soft. It’s ugly now. What you have to do to be a tennis pro is almost like child abuse. In America, they don’t treat kids like that anymore. Now, you’re working on a new film that is sort of a follow-up to Slacker. R. L. : No. One film I’m trying to do is a follow-up to my highschool comedy Dazed and Confused. It wouldn’t be the same characters. I talked about it recently and maybe I shouldn’t have, because I think it got misunderstood. People think Mathew McConaughey is gonna be in it, but he’s not – he’s too old, they’re all too old. They’re 36-40, and it’s college age. It’s about the first week-end of college when you leave home and go off to college, before you have classes. It’s a bunch of guys. They play baseball… But you don’t see any of the sport. It’s these 18 guys living in these two houses. It’s mostly young men behaving really bad. Just the life of being a young student athlete. I don’t have the film financed yet. You never got into television. You never made any TV show. R. L. : No. But I would like to do something like that, like a long-form movie over ten hours. I got something I’ve been working on that would be at least ten hours long. A long version of a movie, rather than a regular TV show, would be the realistic way to do it. I don’t really have a TV show I want to make. I don’t know if there is anything I want to work on for four years. I love movies because it’s a whole new subject each time. It’s like writing a book – you put it away and you move on to something else. I would like to do something like that, like a long-form movie over ten hours. There’s a show about football or baseball, which is quite famous in France. R. L. : Friday Night Lights. Does it show in France? I’m not sure that it’s shown on TV, but I have a lot of friends who have seen it and love it. R. L. : They shot that in Austin. That’s very Texas. They play highschool football. They’re 15 to 18 years old. I only saw small parts of the show, but I heard it’s very good because it’s about the town I grew up in, where the whole town thinks about highschool football. My next film is a period film, set in the 1980’s, so it costs more and has a big cast. Recreating a period is more expansive.